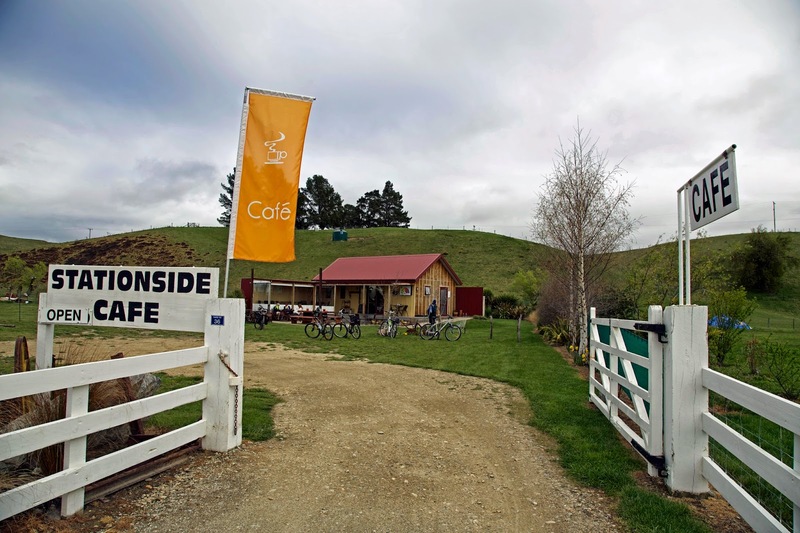 Our second section of the Otago Central Rail Trail must be brought to us by the letter 'O', as today's ride takes us from Omakau to Oturehua. Of course that's after we've checked out Ophir, an old mining town a few km off the trail near Omakau. Our start is sedate: we now have our sister-in-law doing her first day with us. In fact it's her first full day on a bike since she was a girl. Besides, there's a cafe near Lauder, just 9km up the track, and we have a tradition to uphold. The weather has turned fairer, clouds giving way to patches of blue. 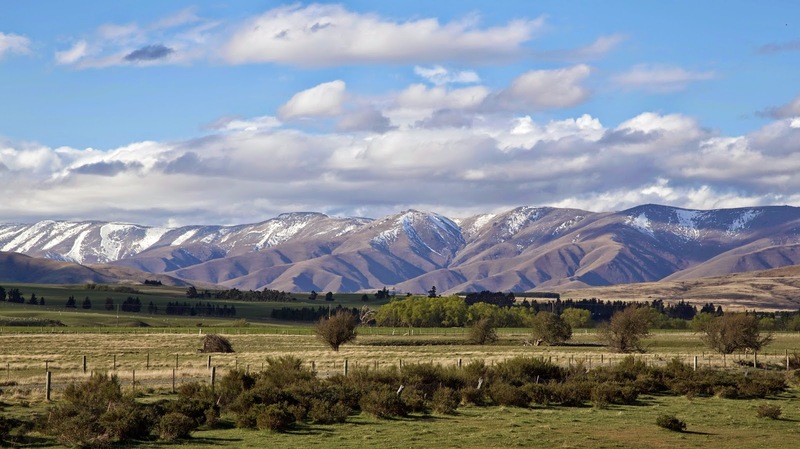 We feel small in the wide open green of Central Otago, with its backdrop of snow-capped, cloud-topped ranges. In summer this place can bake, drying to dusty, pale stubble fields. In winter it can be killing cold, with frosts and snows that might freeze unprotected sheep solid. But we're here in spring, a gentle one too, and the fields are green and amply dotted with sheep. As we cycle past we occasionally spook a ewe with new lambs. She bleats a warning, and the lambs rush for the shelter beneath, butting hard at her udders. Connection made they vigorously wiggle their long tails as though to turn up the volume. Scenes like this are part of the allure of slower travel. At walking or cycling pace you get to see, smell, hear, feel and more fully take in your surroundings. It sounds simple, yet the experience of it is much more profound than the saying of it. For me at least there is a small exchange at the soul level. 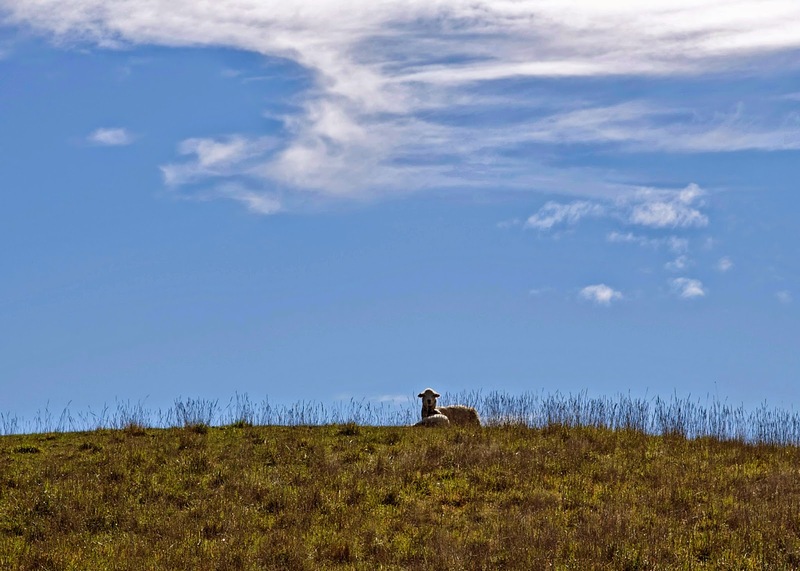 Whether a part of me is left in the lambing fields of Otago, or a part of that place has entered me, I am not sure. Perhaps it’s a bit of both. After Lauder we cross an iron and stone bridge over the Manuherikia River, and climb gradually towards the Poolburn Gorge. We've been told this is one of the most spectacular sections of the OCRT, with long tunnels, a steep gorge and the impressive Poolburn Viaduct. We've planned to meet my sister at the viaduct, although there’s talk of her trying to walk in and meet us at one of the tunnels. The climb is easy enough without wind, and we soon reach the first tunnel. 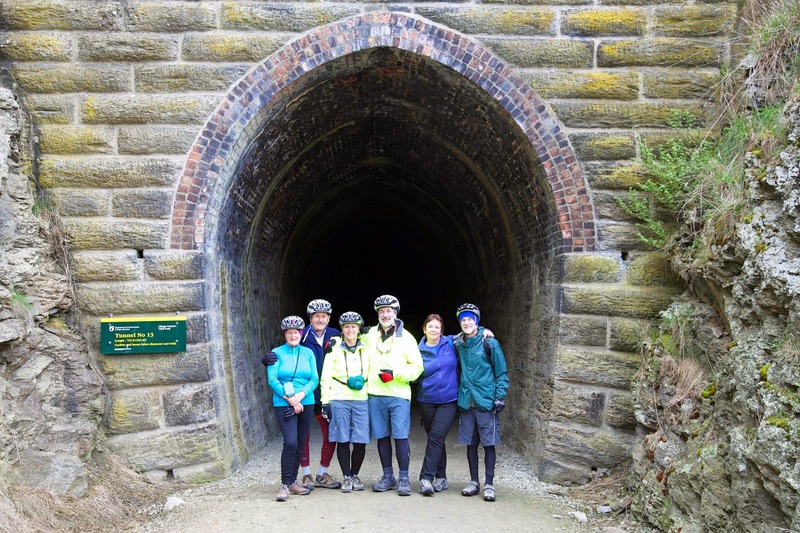 Before going through, a few of us drop bikes and walk off to explore the former tunnel builders' camp. We marvel at the hardiness of these labourers, living for years on these prodigiously steep slopes above the river. What to us is a spectacle was to them a living trial; doing hard physical work sometimes in burning heat, often in ferocious cold, always on menacingly steep slopes. 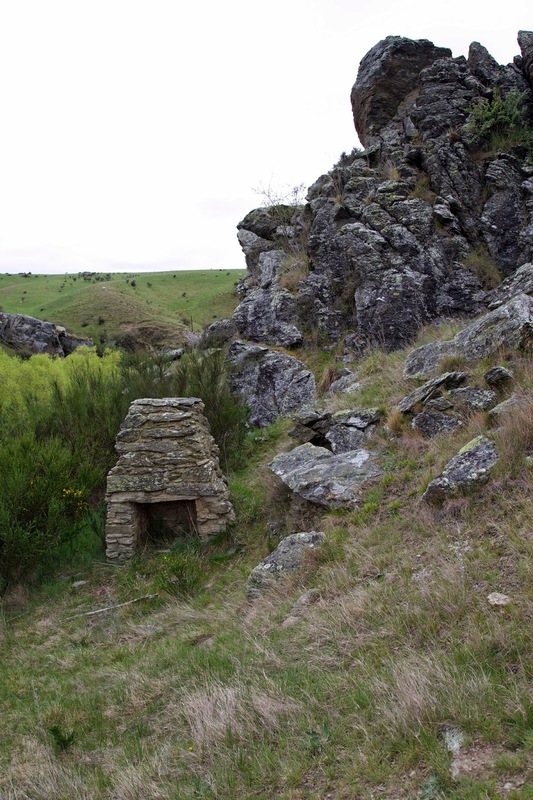 A couple of us wander down to look at the stone hearths and fragments of hut walls, which are all that remain a century or so after the tunnel works were finished. My sister appears from the tunnel just as we’re about to enter it. If it seems like precision timing, it’s only through her hard work. She’s walked about 4km up the trail from the nearest road, borrowing a torch for her walk through the 230m long tunnel. Some of us ride slowly, others walk, back to the Poolburn Viaduct where we pause for a picnic lunch. We’re in time to watch a group of Sydney school students hoon by in the opposite direction. They’re on a training ride prior to some hard-core mountain biking near Queenstown. We wonder aloud to their teacher whether they’re supplied with air bags. He joins us in rueful laughter before cycling off to catch his charges. The last part of the day’s ride is through the Ida Valley. While the slope is gentle, the trail surface is loose and sometimes bumpy, and there are long straight stretches. Oturehua takes its time to appear, ‘though it’s the "support crew' we see first, sitting trail-side with a take-away coffee in hand. Our accommodation, my sister tells us, is “just up that hill”. We grimace and ride on, skirting the not-exactly-vast township, and riding up to what turns out to be a spacious and beautifully set up lodge. A shower, a drink and the views to the impressive Dunstan and St Bathan Ranges are quickly restorative. And so Day 2’s riding is done: 32km, easier going in fairer weather, with enough rugged landscape to make you admire the genius of railway builders past. As for us, there's a sense that we might just be properly broken in to this cycling business.